Maaz, a 20-year old man from Aleppo, has been living in Berlin for one and a half years. He lost his chance to be admitted to university after he was exposed for having obtained a fake high school certificate in southern Turkey, where nearly 700,000 Syrians live. Half of these are Syrian students, and only 180,000 of them have successfully enrolled in Turkish schools. Maaz’s dreams were shattered. He has to start all over again, getting ready to take the high-school exam after losing two years of his life and $400, the price he had to pay to get his fake degree. He had obtained the falsified document from a relative in Gaziantep, sent through the Turkish wire transfer and freight company PTT, which has local and international operations and multiple branches across Turkey. But while Maaz was caught, because of the difficulty of replicating the type of paper used in official documents, this is not true of all cases. Many have succeeded in enrolling in universities unlawfully, as documented by this investigation based on interviews with students and experts. Most falsified documents – as the authors of this investigation noticed – were printed on computer printers, which means the colors produced are different from those of actual seals and stamps. False degrees cost between $100 and $600, depending on the grades included, and the quality of seals and paper used. This is taking place due to weak Turkish government oversight and the lack of powers enjoyed by the Syrian interim government. Forgery is not practiced only by brokers and real-estate front companies. Civil servants in the Syrian interim government and figures in the National Coalition have also been fired after they were caught in the act. The authors of this investigation noticed the practice is ongoing despite the establishment of coordination and data exchange channels between the Turkish Education Ministry and the Syrian interim government. A student we spoke to said he joined the Faculty of Medicine at the University of Gaziantep in 2014 relying on falsified documents without being caught. The student, who declined to be named, said it was easy to verify certificates at the Turkish Directorate of Education / Gaziantep, which helped him in the forgery. For instance, the directorate would only ask for certificates to be translated from Arabic to Turkish and then notarized without verifying their authenticity. None of the employees at the directorate knew how to check the authenticity of [Syrian] certificates prior to the fraud. This issue has since prompted the Turkish government and the Syrian interim government in 2015 to implement more stringent measures for the detection of fraud. They now require validation of all certificates issued after 2012, a year after the eruption of the Syrian crisis. Yet this measure did not deter forgers, who continue to be active until the moment of writing this investigation. The authors of this investigation followed over 30 pages on social media offering their services in issuing certificates in several categories and levels. Most of the individuals behind these services presented themselves as lawyers or former civil servants. After some brief “haggling”, the authors were able to obtain a certificate with the desired grades in return for $400. Abdu, owner of the office in question, described himself as an “expert” on such services and said he has been active for three years. He claimed that the papers were “authentic” except that they were not registered in Syrian government records, meaning they are valid everywhere except Syria. The forger told the authors of the investigation that his office is located in the city of Kilis in southern Turkey. The authors then travelled to the city, where he told them he would meet them at the city’s bus and taxi terminal. Abdu came with his father on April 27, 2015 in the morning, and took the authors to their office. It had no official sign post and license displayed. A “client” entered the office when we were there. The client requested three high school certificates under three different names and one university certificate, and paid a $1700 down payment. Abdu – the officer owner – promised him they would be ready within two days. The authors of the report asked Abdu about the nature of his work. After they earned his trust, and obtained a university certificate they requested in the name of another person, he and his father agreed to be interviewed. – $ 600 for secondary school certificates. – $ 1,200 for university certificates. – $ 1,500 for master’s degree certificates. – $ 2,000 for doctorate certificates. He even proposed that the authors work with him to look for customers seeking certificates in return for a commission. Abdu said that law and sovereignty do not exist in Syria, so no one has the right to stop him or prevent him from working, as he said. Regarding his activities in Turkey, he believes that that the language barrier spares him from legal accountability, as the Turks seem unaware of what he is doing. 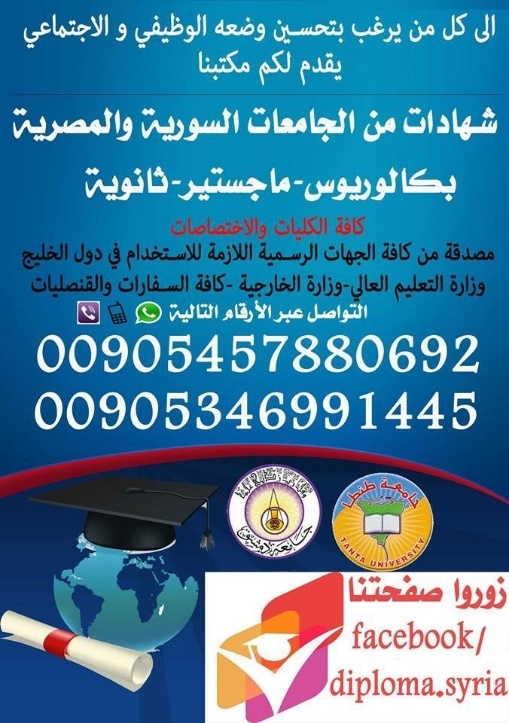 We provide to our Syrian brothers who cannot go to sit the exams for the baccalaureate (Scientific, literary) 100 percent valid and certified certificates. We also provide identification documents and cards to any person. Through the companies we deal with, we can issue work experience certificates in marketing for those interests and also computer certificates. We have all university certificates that can be issued in Syria, including Aleppo University, Damascus University, and Tishreen University, all notarized but not registered (in regime government records) to holders of baccalaureate certificates scientific-literary. Forgers running these ads use false female names on Facebook to obtain trust, as the picture above shows. We contacted the person in question and “she” offered us her services. Some unofficial newspapers published by Syrians in Turkey have also run ads for forged documents services. One such newspaper is Homako, a classifieds paper, which ran an ad by the “Shahba” office offering its services in sourcing all types of official documents, including school and university certificates. The widespread forgery has caused discontent among Syrian students who study regularly to obtain official certificates. Hassan, who is studying at Gaziantep University, said the Turkish Ministry of Education has so far been unable to put an end to the fraud. Hassan complained that there is no online record covering all years, with the existing one covering only the years from 2012 onward. No official side, be it the Turkish government the Syrian interim government, or the Syrian regime Ministry of Education is undertaking this endeavor. Hassan said holders of forged certificates are taking university places from people like him in Turkey. Every Turkish government university has an independent system to admit foreign students, so it is hard to determine the number of university places available to Syrians, bearing in mind that there are 160 universities across Turkey. When Syrian families started seeking asylum in Turkey in 2011, forgeries became widespread in areas like Aleppo and Idlib governorates. Then the phenomenon spread to Turkish cities with the refugees, in the absence of Turkish government oversight and the illegal presence of the majority of Syrians. The authors of this investigation verified this by following the pages offering such services on social media. In the beginning, these pages offered information to new arrivals in Turkey. A while later, the pages became a platform for forgers advertising their services. We counted over 30 pages created on social media by these forgers, including many on Facebook where they can reach a large number of would-be customers. Another forger offered his services to the authors over the phone, including issuing fake certificates using “real stamps” made in Turkey. The forger said the live seals spread some ink between seals, which cannot be replicated by a computer printer. Mohammad Ibrahim, director of the National Coalition’s mission in Gaziantep, confirmed the existence of thousands of forged documents in Turkey, Syria, and elsewhere. He said the interim government and the Syrian National Coalition caught more than 40 falsified university certificates among government and coalition employees. For the purpose, a specialized legal team was retained. The team was able to expose the fraud involving university certificates, which has been going on since mid-2014 throughout June 2015. Those who abused their office were sacked according to Ibrahim, who did not specify the number of employees affected or their posts. Ibrahim called for giving the coalition legal as well as political legitimacy in order for it to act on the ground. He also proposed creating a special body to verify Syrian documents and use electronic documents given the difficulty of communication inside Syria, citing electronic solutions recently implemented by the interim government such as the “bar code and digital fingerprints”. Deputy Minister of Education for Administrative Affairs Dr. Abdul Rahman al-Haj also stressed the difficulty of detecting falsified university documents with the exception of Idlib University whose records were obtained after the city was liberated in March 2015. Haj believes the reason forgers are rife in Turkey in particular has to do with the “freedom of activity granted by the Turkish government” to Syrians. He also said the language barrier prevents Turkish law enforcement agencies from identifying and detecting forgers. The solution, according to Haj, is to obtain graduates’ data and coordinate with the Turkish government to develop mechanisms to crack down on forgery and keep the Turkish authorities up to speed. 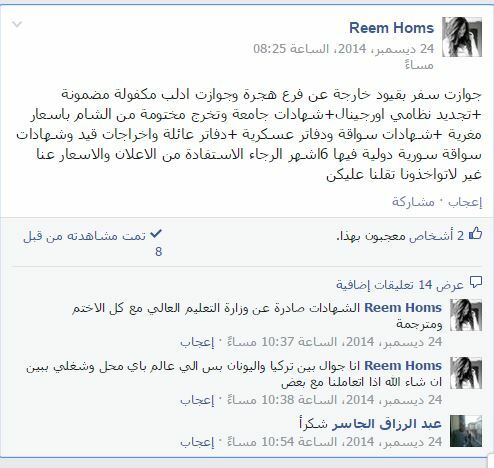 Recent coordination between the two sides has already led to prosecution of some forgers. The number of offices working in forging certificates near the border between Turkey and Syria is not known. It is difficult to catch the forgers, as they deal with their “customers” in utmost secrecy. On the Turkish side, the authors of this investigation tried to meet with the governor of Gaziantep and other officials to obtain more information, but their request was denied. 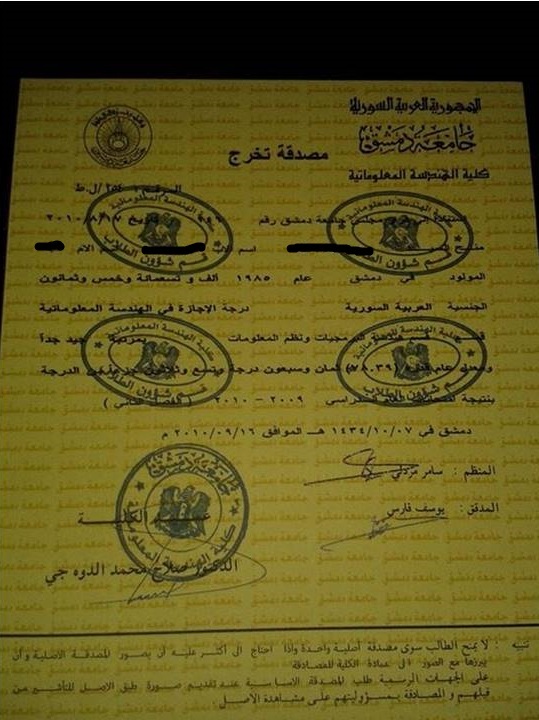 The Ministry of Education in the Syrian interim government proposes quick measures to curb forgery, for example by issuing high school certificates containing a barcode that cannot be counterfeited, while the corresponding database would be accessible to the Turkish government, according to Dr. Abdul Rahman al-Haj. The Deputy Minister of Education for Administrative Affairs began implementing this measure as of 2014. The authors of this investigation could not reach Turkish officials despite repeated attempts to contact the security services in Gaziantep, the governor’s office and departments dealing with Syrians and foreigners at the Directorate of Education. At the start of the current school year, the Turkish government launched a standardized test for students to test their proficiency in the courses of the last school grade leading to high school certificates. 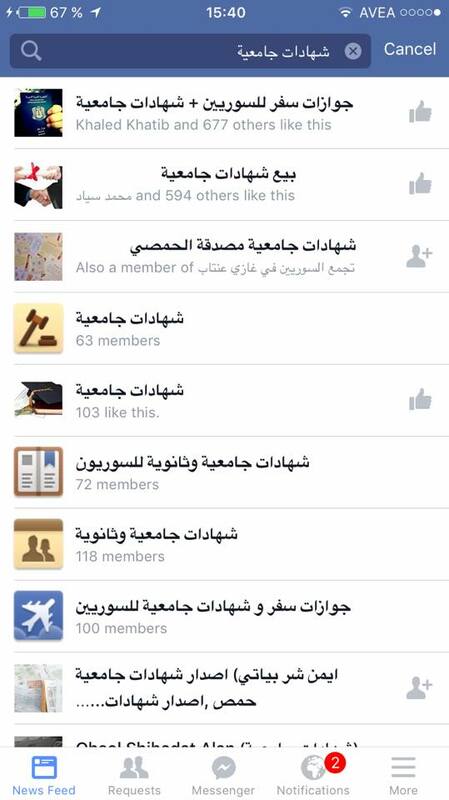 The types of school certificates available in Gaziantep include: Libyan, coalition, regime, Iraqi, Sudanese, and falsified degrees. This has led to great confusion among high school students, especially since every institute teaching one of the curricula listed above extensively promote their programs to attract the largest possible number of students. Many students actually prefer to go to regime areas in Aleppo to take the third secondary school grade exam, which is more recognized than other certificates (e.g. coalition and Libyan certificates). Meanwhile, the coalition-issued certificate, granted by the Ministry of Education in the interim government, is recognized in Turkey, France, the US, Qatar, and Germany, according to the ministry’s website. However, many students have run into problems when trying to get the coalition-issued certificates accredited. Ali Ibrahim, a student who holds a literary baccalaureate certificate issued by the Syrian National Coalition, said: “I travelled between Gaziantep and the province of Hatay.” “The Turkish education authorities refused to recognize my certificate, even though the Ministry of Education in the interim government had announced earlier coalition-issued certificates are accredited in Turkey,” he added. In the same context, many students have taken interest in studying under the Libyan curriculum, which is popular in Gaziantep in private Syrian schools. There are more than 15 schools teaching this curriculum. Most students we spoke to said educational requirements have become complex. Secondary students study without knowing the source of the certificate they would obtain later, and many are surprised when they find out the documents are not accredited or that getting them recognized requires many conditions. A segment of Syrian secondary school students also went to Iraqi schools in Gaziantep, but these do not admit anyone unless they have formal certificates showing the last completed class from an accredited school, according to the Dar al-Salam school we visited earlier. Officials at the school told us the Turkish education authorities have not yet completed the registration of Iraqi schools. However, students who obtain certificates from the school, can apply to enroll in Turkish universities, as these schools’ certificates are issued by the Iraqi Ministry of Education. Initially, the accreditation of 12th grade secondary school certificates was possible for all Syrian students, regardless of the source of the certificates (Libyan, coalition-issued, or regime-issued). Libyan certificates are issued to those who pass Libyan high school exams in Gaziantep. The coalition-issued certificate is based on a curriculum developed by the Ministry of Education in the interim government with the help of an expert panel. Its content resembles that of regime curriculum with some amendments. Regime-issued certificates are based on the curriculum taught at regime-run government schools given to those who pass official exams. Shaikho added that 2015 is the first year where Syrian students took the test, most of them succeeding. Regarding the content of the test, Shaikho said it includes general topics divided into scientific and literary subject matters taught in third secondary grade [12th grade]. But many students lost their chance to take university admission tests in Turkey this year because they were not aware they had to sit the standardized tests. Now they have to wait until next year to do so. There were rumors this month about a new standardized test within the year, but this was subsequently denied by the Ministry of Education in the Syrian interim government. The number of Syrian refugees in the Turkish city of Gaziantep has seen a marked increase recently. A report issued by the Gaziantep city council in January said the number of Syrian refugees in the city had reached 315,000, half children under the age of 18. Both reporters tried to contact the Ministry of Education in the Syrian interim government to get information and figures on the number of students who have applied to register for third secondary grade exams, but received no response. There are four educational centers in Gaziantep while the number of teaching staff who had received training is about 600. The number of school-age students who originally enrolled in the schools is 48,000. The number of students is increasing as battles move further north in Syria, pushing more Syrians to flee to Turkey. This happened recently in the eastern countryside of Aleppo, the northern countryside of Raqqa, and the northern Hasaka countryside.